about? I’ve discovered mine, and it’s tea! 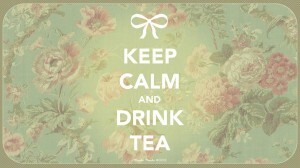 Even the word has a nice ring to it and just the thought of a cuppa makes me relax deeper into my chair. They say tea takes you to another place. Mine is a place that’s soft and warm and safe. For me, tea trickles to my extremities and fills all the tiny spaces in my mind and body that need to be filled. A sense of satisfaction and contentment radiates out from my sometimes weary heart. where hectic is now a normal pace. Sometimes you can taste the misty mountains or the rich damp soil or maybe if you are lucky, the water which has taken its own exquisite time to seep through rock to nourish the tea plant itself. That’s a very special taste and can evoke many emotions. Where did your passion take you today?